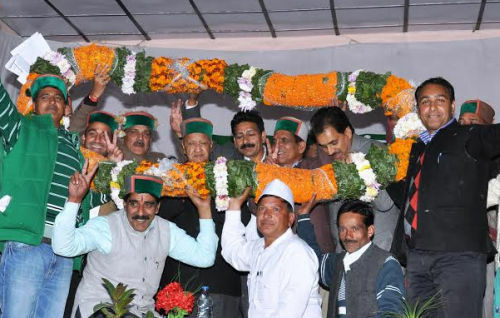 A delegation led by MLA Kishori Lal from Ani met the Chief Minister Prem Kumar Dhumal and thanked him for opening Sub Tehsil at Nithar in Ani Sub-Division of district Kullu. While interacting with the delegation, Chief Minister said that the State Government had always endeavoured for providing every basic facility to the people residing in rural areas of the State and keeping this in view the Sub Tehsil Nithar had been opened to facilitate the people of the area. Chief Minister claimed that the present State Government had constructed 40 roads measuring 170 kms and had also sanctioned various schemes amounting to Rs. 56 crore of Irrigation and Public Health Department in Ani Sub Division. Besides, Rs. 13 crore ,66 KV Sub Station had also been set up in the area. He said that the possibilities were being explored for constructing tunnel below Jalori Pass so that people of the area could be facilitated and tourism be promoted. Kishori Lal, while thanking the Chief Minister said that the people of 10 panchayats would be benefited from opening of this Sub Tehsil. He also thanked the Chief Minister for giving liberal funds for carrying out various developmental activities on accelerated pace.